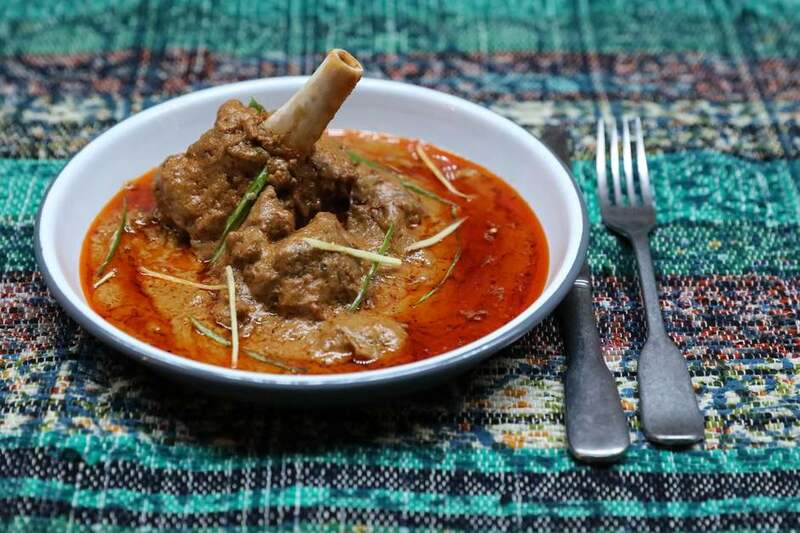 Posh kebabs, fragrant biryanis and dishes based on the beloved food of the Mughal emperors inspire much of the cooking at Lucknow 49, a neighbourhood Indian restaurant from Dhruv Mittal and the team behind DUM Biryani. Specialising in Lucknowi cuisine, the low and slow Awadhi cooking typical of the city in North India, means the Maddox Street restaurant serves fluffy biryanis, galauti kebabs and curries at the centre of the table. At lunch, visitors can order quick bites including a multi-layered gilafi kulcha with a choice of chicken kakori or lamb galauti kebab, and a smaller version of the biryani to take away. Eat in and you can enjoy the rustic space decorated in earthy tones and a soundtrack of acoustic Indian tunes and Urdu pop. Duck under an archway to get to the back of the restaurant where there's a more industrial look and a wall of living plants growing beneath a skylight. Brightly-coloured enamelware, tables embedded with white or green marble and banquettes upholstered with vintage textiles complete the look. Lucknow 49 gyms, sporting activities, health & beauty and fitness. The best pubs near London Lucknow 49. Lucknow 49 clubs, bars, cabaret nights, casinos and interesting nightlife. Where to have your meeting, conference, exhibition, private dining or training course near Lucknow 49. From cheap budget hotels to luxury 5 star hotels see our special offers for Lucknow 49 hotels, including The Courthouse Hotel from 93% off.